The coat o airms o Somalie wis adoptit on October 10, 1956. The leopards which support the shield an the white star wur an aa foond on the airms uised during the Italian admeenistration. Formerly, the airms o Somalie frae Juin 8, 1919 featurt a shield dividit horizontally bi a wavy white line (Smith, 1980). The tap half o the shield wis blue wi a leopard in naitural colour surmontit bi a white five-pointit star. 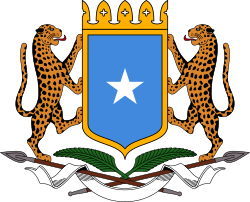 Wikimedia Commons haes media relatit tae Coats of arms of Somalia. This page wis last eeditit on 10 October 2018, at 17:41.